At the edge of one of the most beautiful beaches of Mauritius, guests will discover the height of luxury accommodation behind the doors of the Presidential Villa. Guests will be left with nothing to desire as a private valet will be at their every beck and call throughout their stay. As soon as guests enter the hallway, they are greeted with the incredible view that overlooks the Morne lagoon. Lavish furniture and interiors in soft, sophisticated beige create an inviting ambience where guests will enjoy the best of the modern amenities available in the villa. The immense terrace and lush private garden invite guests to enjoy the finest of al-fresco living with a dedicated kiosk for candlelit dining, sun loungers in the shade of tropical palm trees and plush outdoor furniture to simply relax. Four spacious bedrooms, all with a lavish en-suite bathroom and tropical outdoor shower, overlook the lush garden and endless blue ocean. Bright oranges and warm reds create a serene holiday feel throughout the villa. 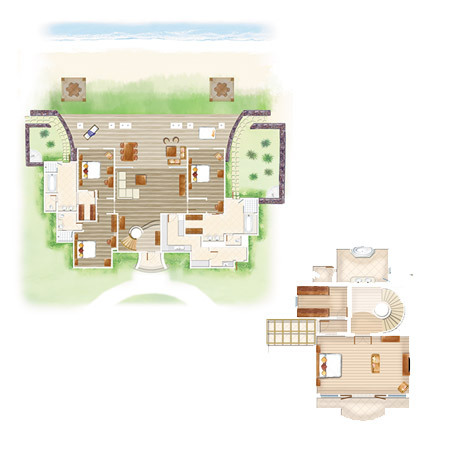 A staircase leads to the top floor where the master bedroom, chic en-suite bathroom and private solarium provide a peaceful haven for parents to enjoy special holiday moments together. This sumptuous villa allows all its guests to make the most of the space and modern facilities as they desire. A club car remains at guests' disposal and a chef is made available upon request, allowing guests total flexibility. This villa exudes refined comfort and privacy, representing the epitome of luxury holiday living.